LOS ANGELES (AP) This was the plan from the beginning. It just took a little longer to come together than Oklahoma City had hoped. 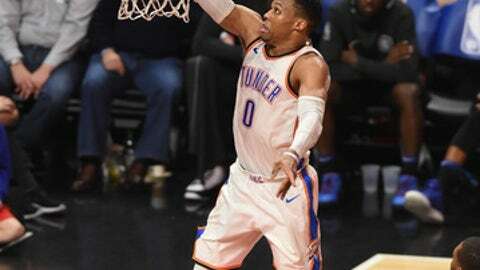 The Thunder added All-Stars Paul George and Carmelo Anthony to MVP Russell Westbrook and waited for the wins to roll up. And then they started 8-12. They’ve hit their stride now, though, as evidenced by a 127-117 victory Thursday night that ended the Los Angeles Clippers’ four-game winning streak. Oklahoma City’s ”Big Three” was on full display: Westbrook had his 13th triple-double of the season with 29 points, 12 rebounds and 11 assists in his latest homecoming. George scored 31 points and Anthony added 22. They almost dared the Clippers to outscore them. ”Absolutely, when we’re on, all three of us hot like that, it’s going to result in a lot of wins,” George said. The Thunder have won eight of their last 10 games. Despite a rash of injuries, the Clippers had also been playing well. They led by three going into the fourth quarter but then were immediately outscored 12-0, mostly by the Oklahoma City bench. DeAndre Jordan led the Clippers with a season-high 26 points and 17 rebounds. Lou Williams had 26 points and Blake Griffin scored 24, but it wasn’t enough to keep up with the Thunder. Clippers: G Austin Rivers, originally diagnosed with a strained Achilles and expected back quickly, got a second opinion and now has been diagnosed with a bruised heel. The team called it posterior right ankle impingement. ”It’s not the best news, obviously,” said coach Doc Rivers, Austin’s father. ”He’ll be evaluated in two weeks, which doesn’t sound great right now. I think we’ll find out a lot more in a couple weeks.” Austin Rivers had started every game he played since the third game of the season. The star forward has not been shy about his desire to play in his hometown of Los Angeles, particularly for the Lakers. He can become a free agent at the end of the season. The Clippers were already playing without guards Patrick Beverley (knee surgery) and Austin Rivers (bruised heel), along with injured forward Danilo Gallinari. Now, for the second time this season, Los Angeles has lost starting point guard Milos Teodosic.